This report documents the relative effects of policymaker’s engagement towards the success or failure of agricultural innovation processes at country levels in Africa. It provides evidence that validates the factors that influence the engagement of policymakers in the success or failure of Agricultural Innovation Processes (AIP). This study was conducted as part of the Programme of Accompanying Research for Agricultural Innovation (PARI); a sub-set of the “One World – No Hunger” initiative of the government of Germany. Fostering an effective engagement of policy makers at different governmental levels is vital to the delivery of the central objective of the initiative and other agricultural development action, hence the study. To understand the intricate steps to actively draw inputs from the policy making systems at country level, this study examined 32 case studies of agricultural innovation processes; 15 of which are successful and 17 non-successful. 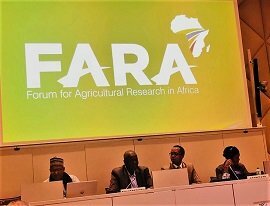 The cases were drawn from five Africa countries that are participating in the PARI project. Eight (8) cases were drawn from Benin republic, Eight in Ghana, four in Mali, Seven in Togo, and five in Tunisia between year 2017-2018. The different casees were analysed to profile the key steps in the innovation processes, with focus on the initiation period; reasons for initiation, key stakeholders involved, the roles played, results obtained, and various evidence to substantiate the deliverables. Key stakeholders who participated in the innovation processes were identified using the snowball sampling method and interviews. An interview guideline was developed and administered. In total, the cases studied comprised of 15 technologies (of which, 5 were successful), 10 varietal improvement programs (of which 9 were successful), and 6 institution/organisation interventions (of which 1 was successful). The engagement of the stakeholders with appropriate competencies came out strongly as a key factor that influences the success of the interventions. Appropriate identification of policymakers’ needs and alignment of interventions to their needs also play a major role in the success of interventions. Five categories of policy interventions drivers were identified, they include: Research partnership (RTP), financial and technical partnership (FTLP), action Implementation Partnerships (ILP), Beneficiary and Advocacy partnerships (BALP) and High-Level Decision-Making Partnerships (HPDLP). Our study further reveals that researchers (100%, with N=32), financial and technical partners (94%), and implementers (94%) were the predominant policymaking groups in the agricultural innovation processes. Meanwhile, beneficiaries (78%, with N=32) and high-level policymakers (75%) were poorly engaged. This study concluded that the engagement of competent researchers, adequate financial supply, adequately capacitated technical partners, smart engagement with target beneficiaries are the key to a successful agricultural innovation process.